Your wheels are assessed for buckles and obvious cracks or damage. Tyres are removed and checked for roadworthiness. At this stage we endeavour to inform you of any problems with valves, tyres, buckles or cracks. However, these issues are not always evident at this point and may not become apparent until later in the process. Wheels and tyres are given a unique code, providing full traceability. 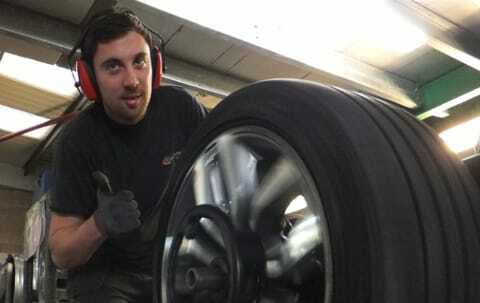 Your tyres are stored safely and your wheel’s head off for the next stage. 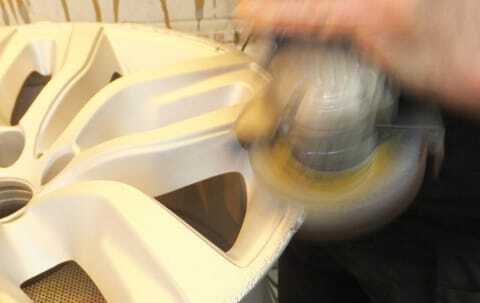 Your wheels are placed in our wheel processing plant to remove the existing coatings. We have the largest plant in the UK, it’s suggested that it might even be the largest in Europe! Once the existing coatings have been removed (this takes several hours) they are sent to our preparation department. Following the surface preparation in our automatic blast machine, your wheels are finished by hand to ensure a perfect surface for powder-coating. At this point, any cracks that may have been hidden by the existing coatings or road grime, become easier to see and we’ll let you know immediately. Our powder-coat production plant has been specifically designed for wheels, in fact we have two of them! 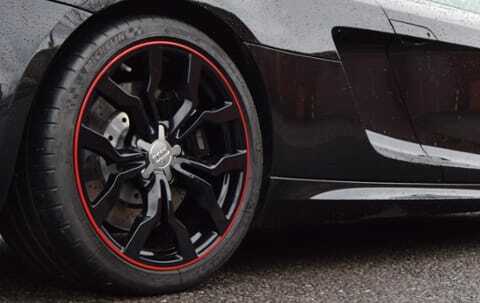 Your wheels are now powder coated and finished in the colour of your choice, as much as possible we follow the manufacturers process and in most cases use the same paints, powders and lacquers that they do. Once fully cured they are removed from the production plant, placed on bespoke trolleys and allowed to cool. Wheels that require diamond cutting are transferred to our lathe department otherwise they are move on the next stage. At this point, wheels that have tyres are separated from those that don’t. Tyres are checked once again for roadworthiness and bulges that may not have been obvious during stage 1. Your wheels are then balanced using adhesive weights and if you have your vehicle on our site, we will re-fit the wheels ensuring that the wheel bolts are torqued to the appropriate setting. It’s important to note that whether we fit your wheels to your car or you do, it is our recommendation that you check the torque settings after no more than 30 miles of driving and re-torque as required.